They say everyday is a school day….and if that’s the case then May 11th 2017 will be a fantastic one for me….having been approached by Kim Lynch soon to be a graduate photography Student from Saint Kevin’s College in Crumlin about a collaboration body of work for her graduate show in early 2016. After much discussion and back and forth we settled on a fantastic idea of project that combined a couple of our passions, the first was Lomography, Lomo or Lofi photography has been something I have been playing around with in the last ten years and have completed a few body of works in the area. The second was travel photography…..and behold a project was born….. The work explores the relationship between surrealism and the latent image…….or we could just say it’s about two photographers doing what they do best…MAKING IMAGES! One shoots a roll of film then they hand it over to the other and the film is reloaded into a camera and shot a second time…the images produced are a double exposure that combine the two distinct images into a single picture, add to that the unpredictable nature of the Lomo cameras with their unique aesthetic, and the images can be fun, abstract, haunting, surreal. For my part the images have been shot all over the world in places such as Morocco, Italy, Hungary, Slovakia, Iceland to name but a few. For Kim’s part her images are shot closer to home with a few few travel destinations of her own thrown in. So pop along for support a fantastic college like Saint Kevins College, who are producing some amazing photographers with their own brand of theory, vision and techniques, with some amazing educators like Martin Cregg designing and coordinating courses. As well as some amazing photography student whom i have the pleasure of working and meeting in their over the last few months. 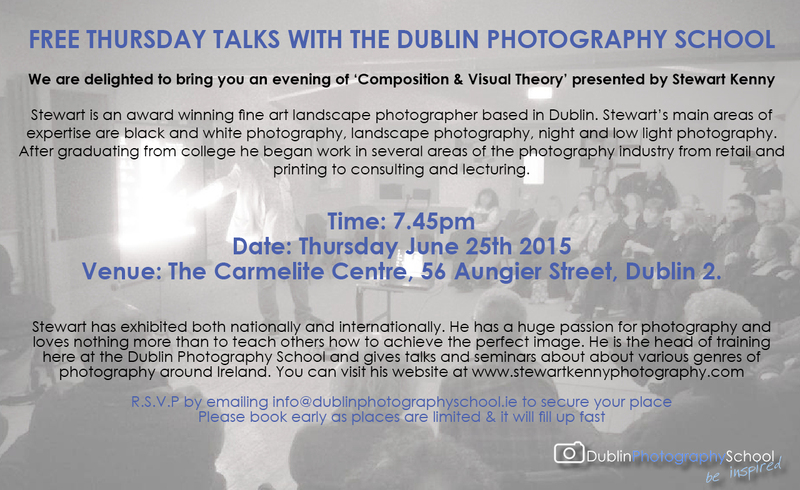 Stewart is an award winning fine art landscape photographer based in Dublin. Stewart’s main areas of expertise are black and white photography, landscape photography, night and low light photography. After graduating from college he began work in several areas of the photography industry from retail and printing to consulting and lecturing. Venue: The Carmelite Centre, 56 Aungier Street, Dublin 2.